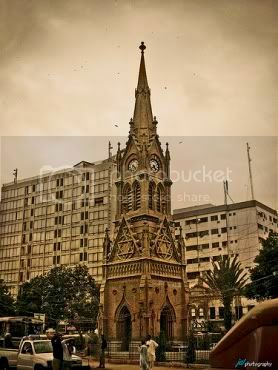 On these pages of ATP we are starting a new series on architectural landmarks of Pakistan. As first part of this series, we will take you to a visit to Merewether Tower, Karachi or as locals affectionately call it – the ‘Tower’. It is one of the most known, but arguably the least acknowledged landmarks of the city. It is most known because it is located at the confluence of two major roads of the city viz. I.I. Chundrigar Road (formerly Mc Leod Rd) and M.A. 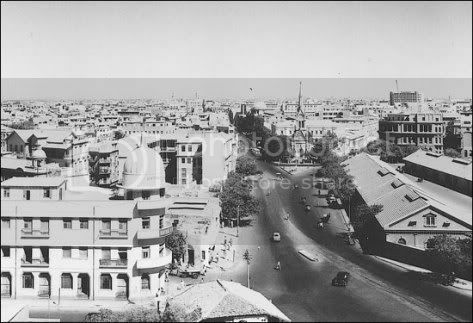 Jinnah Road (formerly Bandar Rd) therefore most of the city people have seen it. It is also one of the major terminus of city buses. All around the city one can hear bus-conductors shounting tower tower. Therefore even those who have not seen it; they have at least heard about it as echoing sound waves. Despite all the fame, it is least acknowledged in a sense that very few people actually take time to visit it or even look at it as an architectural heritage of Pakistan. Even lesser number of people know the history of it. For many people, it is just there since time unknown. 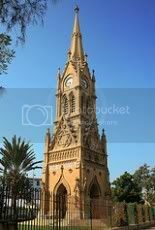 The foundation stone of Merewether Tower was laid in 1884 by the then Governer of Bombay, Sir James Fergusson. 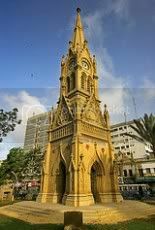 It took 8 years in construction and in 1892 it was handed over to Karachi municipality by then Commissioner-in-Scinde Evan James. 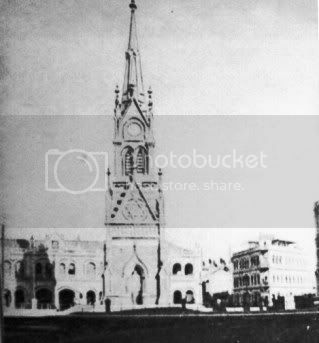 The photo to the left is circa either late 1880s or early 1890s therefore it either shows Merewether tower when it was almost complete or just after completion. The architecture of Merewether Tower is similar to the buildings designed in ‘English Middle Ages’. 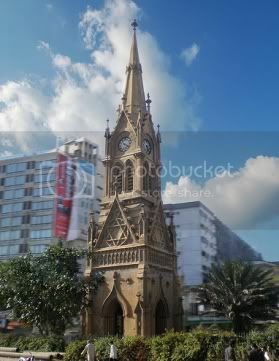 It was designed by the Karachi Municipality Engineer, James Strachan. It is said that James Strachan designed the tower to evoke memories of Medieval England (11th to 15th century A.D.). It is built in buff colored Gizri stone and shows a heightened sensitivity to detailing and emphasis on carving and decoration. 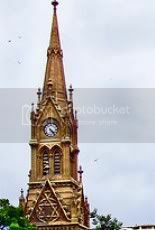 It is said that the architecture of Merewether Tower is in the form of an Eleanor Cross. Eleanor Crosses were 12 stone monuments which were erected in England between 1291 and 1294. 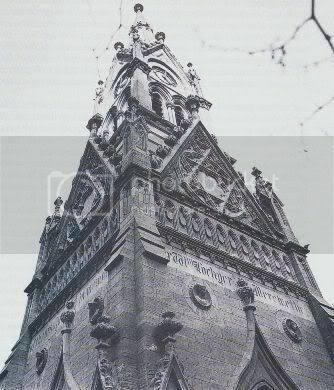 Three of those original Eleanor Crosses still exist in England alongwith several replicas as well as those which share their form. Merewether Tower, Karachi is one of those which share their form with the originals. Before we go further on the architecture of Merewether Tower, a quick note on the original Eleanor Towers. Why were the created? They were created by King Edward I in memory of his wife Eleanor of Castile. 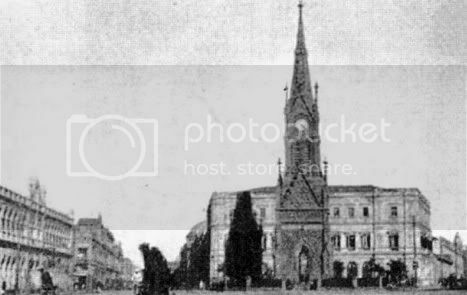 Her dead body was being brought to London for burial and wherever the funeral procession spent a night on their way to London, an Eleanor Cross tower was erected as a monument. Following photo shows Merewether Tower in 1928. Also visible in the background is the historic Rustomjee Building. Building designers of the time had become increasingly aware of the capabilities of Indian craftsmen, thus the skill and craftsmanship which has been available to medieval builders was also at Strachan’s disposal. 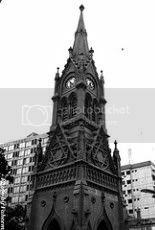 Strachan was no doubt aware of the intricate carving executed by native craftsmen for the baserellets designed by Kipling for the Crawford Markets and the then under construction Victoria Terminus. The Memorial shows a heightened sensitivity to detailing and an emphasis on carving and decoration, more then my other building designed by Strachan. Whereas the Empress Market’s tower is a little squat, the Merewether Tower is elegant and tall, evoking memories of medieval England. In the photo above, one can easily appreciate the detailing and craftsmanship that went into the construction of Merewether Tower. Merewether tower stands on a platform which is 44 feet square and rises to a height of 102 feet. It prominently displays clocks on all four sides. 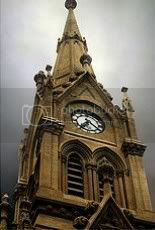 The clocks are situated at the base of a spire which is 72 feet high from the ground. The clocks are 7 feet in diameter. In the last few years a protective iron fencing has been provided all across the tower to keep anti-social elements away. This iron fencing is visible in the photo to the right. The Photo to the left is possibly the most copied photo of the Merewether Tower on the web. Whatever search I did for the tower on the web, this photo kept popping up on every other link. 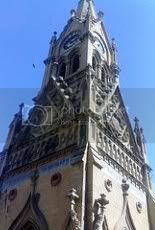 It is courtesy of Iqbal Khatri, whom we incidentally featured in another post related to towers called ‘pateeli towers’ of Jodia bazaar, Karachi in 2006. When constructed, the tower had a large bell and several smaller bells. The larger bell used to sound every hour and smaller ones ever quarter of an hour. The weight of the larger bell at the time of installation was three hundredweight (cwt) which is equal to present day’s ~336 lbs or ~153 kg. Smaller bells weighed one hundredweight each which is equal to present day’s ~112 lbs or ~51 kg. I am unable to research if these bells are still present inside the tower or not. One thing is for sure that they don’t sound any more. At the time of completion, the total cost of the project came out to be Rs 37,178. 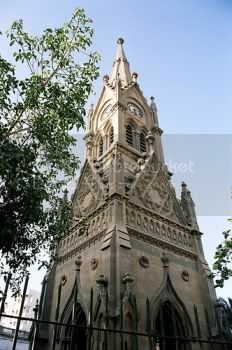 The Tower is still maintained by the City Government of Karachi. Some sources on the web suggest it is maintained by the Karachi Chamber of Commerce and Industry. Any authentic information from our learned readers will be appreciated and I’ll do the correction here. Merewether Tower did go through a major restoration in 1992 on the eve of its century celebrations. I do remember that its walls were washed and monument lighting was provided which gave it a beautiful look at night. Following photo of Merewether Tower is from 1958. Photo credits to PPL. Note how many changes have taken place in the landscape since then. There is no Habib Bank Plaza on Chundrigar Road (McLeaod Rd) yet (construction started in 1959). I also don’t see the ‘minaar’ of Memom Masjid in Bolton Market in this photo. Merewether tower stands as the most towering structure at that time (1958). Following is the google earth image of area around the Merewether Tower whose location is marked by the yellow traingle. 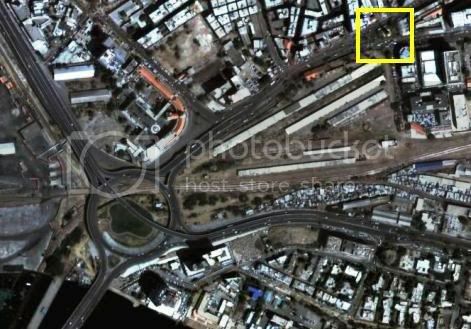 To get more sense of direction, the big road circle shown below is part of the Jinnah Bridge connecting Karachi with Kimari peninsula. The photo to the right is circa 1980. It was the cover view of Karachi’s toursit map printed by Pakistan Tourism Development Corporation in 1996. This photo is a great snapshot of history. If you look carefully the famous and once grand Rustomji Building building behing the tower lays in ruins without roof. One can see its broken walls in this photo. The road to the right is famous I.I. Chundrigar Road which is also called the Wall St. of Pakistan because of so many of the bank headoffices located here. One of our avid reader Shahran Asim pointed me to the fact that Merewether Tower also features in the famous Ahmed Rushdi song titled ‘bandar road se kimari’. I have been able to find the audio of this song at youtube (see following) and Tower is mentioned around time stamp “4 min 15 sec” in it. We are featuring this song here to document all the details about Merewether Tower that we are able to find. 3. Karachi Tramway of Yesteryears. 2. J.W. Smyth, Gazetteer of the Province of Sind B Vol 1 Karachi District, Government Central Press, Bombay 1919. Reprinted by Pakistan Herald Publications Ltd, Karachi. TOWER WITH MY LATE FATHER TO FETCH A BUS. KARACHI WAS A CALM AND MOTHERCITY FOR EVERY NEW COMERS. I am not sure about any conspiracy theories about the star of David but it does signify that Karachi and Pakistan as a whole used to be a place where people of all religions used to live in peace and harmony. I am sad to see that it has now been replaced with animal like behavior by people with no respect for human rights. One would think and hope that with the passage of time civilization should moves towards improvement in civility but unfortunate to see that the movement in Pakistan is backwards. I hope things turn for the best. 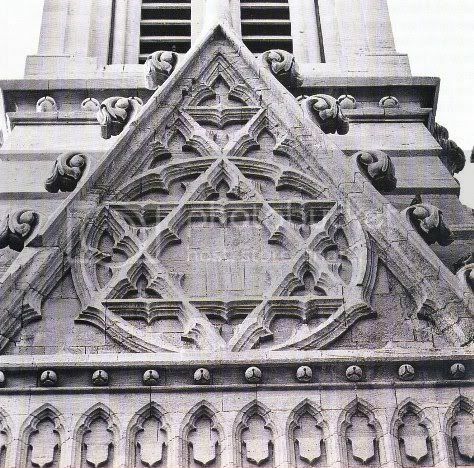 Its a wonder that there isn’t any conspiracy theory about the David star in the center of the Tower. Zaid Hamid Beware!!! it is great hitorical place. i a m very much impressed of old mesons. because in modren meson such type of beauty not found. i am very impressed.